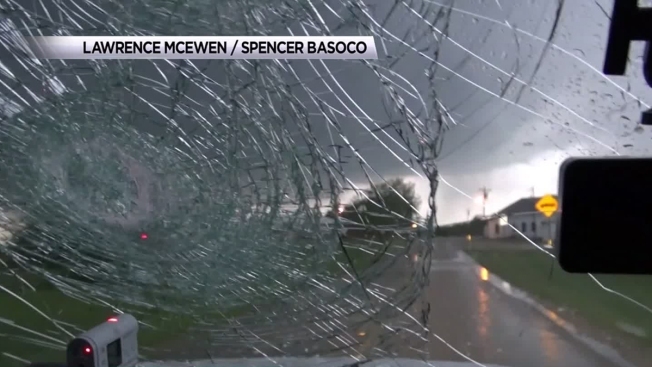 Softball-sized hail destroyed the windshield of a car driven by storm chasers in North Texas Sunday afternoon. Lawrence McEwen and Spencer Basoco were chasing a supercell storm in Erath County southeast of Stephenville when they came upon the intense storm that spawned numerous twisters and several inches of rain. Cameras were rolling inside as stone after stone slammed into the car, some estimated to be five inches in diameter, shattering the windshield. One of the storm chasers, covered in shards of glass, put on goggles to protect his eyes as they tried to find shelter out of fear the windshield wouldn't hold. NBC 5 Meteorologist Brian James referred to the softball-sized hail as ice bombs that explode when they slam into cars or glass. As the chasers waited out the storm, huge hail stones could be seen bouncing off the ground outside. The windshield took at least three direct hits and was destroyed by the time the storm subsided. Neither of the chasers reported any serious injuries. It is never recommended to be outside during a hailstorm and, even when inside, people are advised to stay clear of windows due to flying objects and debris. 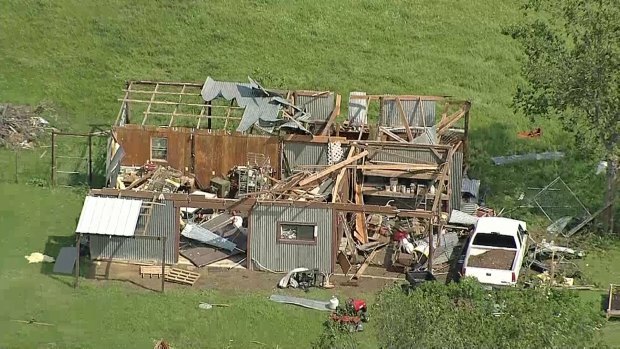 The National Weather Service was checking on reports that as many as 18 tornadoes hit North Texas on Sunday. UpdatedGray Family Lawyer: "This Is Our Moment to Get It Right"